Last January, rebels in the Central African Republic agreed to a ceasefire with the government, after taking over much of the country. Now, despite the formation of a unity government, the ceasefire has broken down and the rebels are once again advancing on the capital and other towns. Read on for a summary of events. Update (March 24, 2013): The Séléka rebel coalition has now taken the national capital, Bangui. After reaching a ceasefire with the government on January 11th, the Central African Republic's Séléka rebel coalition began integration into a new unity government, with several rebel leaders receiving prominent positions in President François Bozizé's cabinet. However, the violence did not end completely. Bands of rebels attacked the southern towns of Dimbi and Kémbé less than two weeks after the ceasefire, and occupied the southern city of Mobaye for two weeks in February before finally withdrawing on the 20th. Another group attacked and took over the northern town of Sido on March 1st. By March 12th, the rebels in the south advanced once again to seize regional capital Bangassou. On March 18th, it was reported that the Séléka rebels had "detained" their five ministers from the Central African Republic unity government, and issued a 72-hour deadline for their demands to be met. Sure enough, on March 20th a rebel spokesperson announced that the ceasefire had come to an end. In the northwest, rebels claimed to capture Bouca and Batangafo soon afterwards (the latter had already been reported taken once in December). In the south, they continued onward toward the capital city of Bangui, seizing the town of Damara despite the presence of a multinational African peacekeeping force, which did not fire a shot. Meanwhile, they had captured yet another regional capital, Bossangoa, in the northwest. 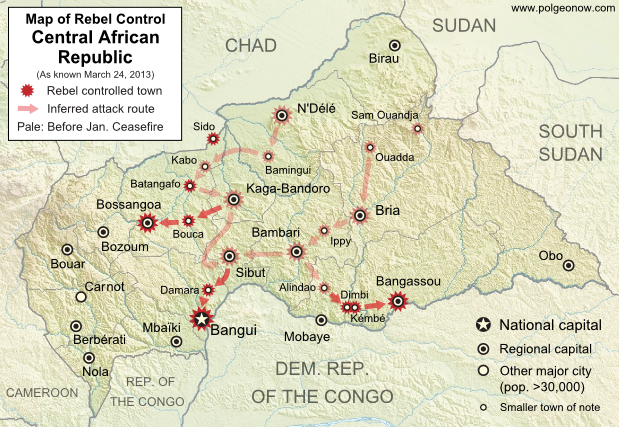 Today, March 24th, the Séléka coalition rebels reportedly took control of the national capital, Bangui, with President Bozizé fleeing across the border into the Democratic Republic of the Congo. It still remains unclear what will happen next. Stay tuned to Political Geography Now for further updates!